AnyCount cannot count only bold text. But we have a workaround which will allow you to do this. 1. Make a copy of your source document. 2. 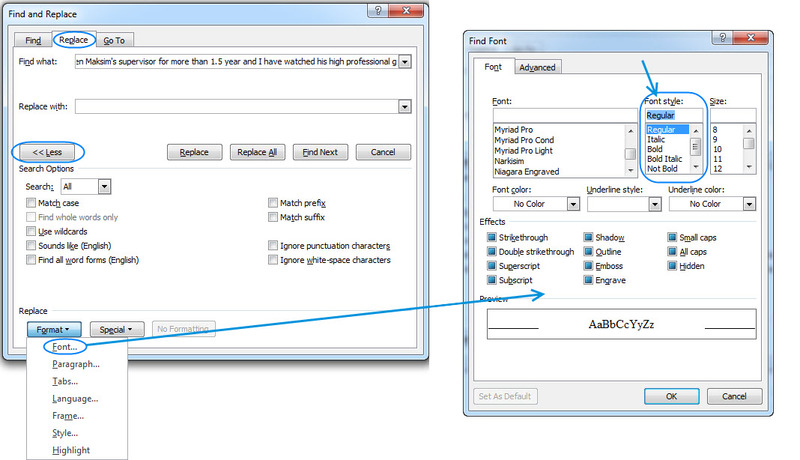 Cut all non-bold text from your document. For this, in your MS Word select the 'Find and Replace' option (do not enter any text in Find and Replace fields), Click the Format button on the Change section and select Regular font (see Picture 1). Then click the 'Replace All' button. Your MS Word will eliminate all text with normal (non-bold) text from document. Please note, you can use this function the same way if you have any other types of text that should be deleted\kept. 3. Save the file and count it with AnyCount.